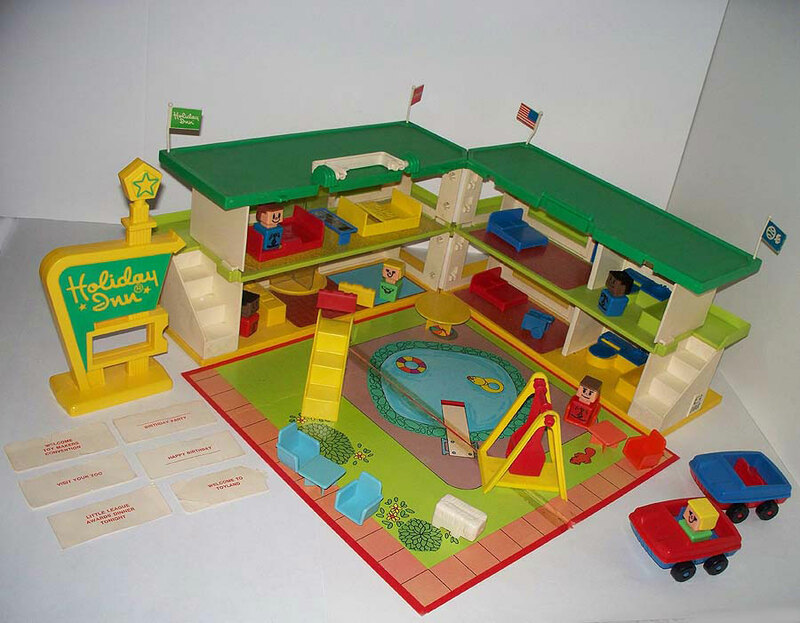 Description: The Familiar Places Holiday Inn® playset is sure to make every vacation more wonderful. 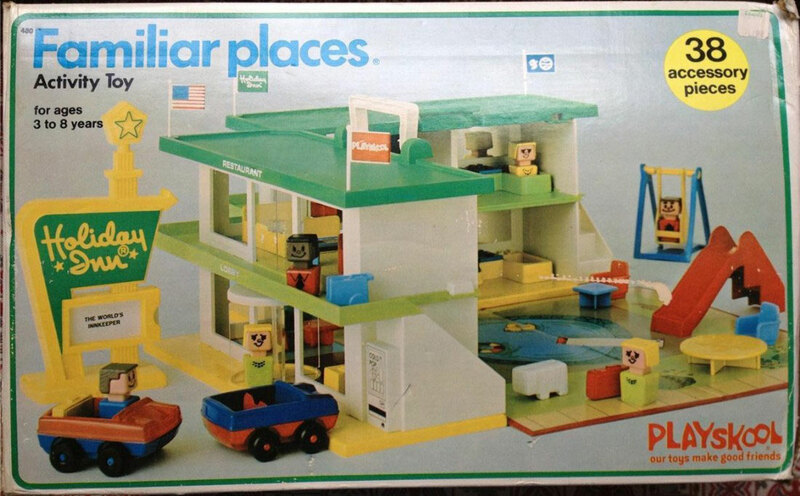 Designed to closely resemble the 1970's era Holiday Inn® hotels, and packed with just as many amentities: inviting lobby with revolving doors; family restaurant with a full buffet, deluxe rooms with full bath, outdoor pool, playground, and even a dog kennel for vacationing pet lovers. This set includes several exclusive, and very hard-to-find accessory pieces. The flags, cards for the sign, linen cart, and the dog are the most hard-to-find. PSKB480 - Holiday Inn® Base - White 2-story rectangular hotel with a yellow base, light green 2nd level floor, and a flat green roof. The hotel has a white carry handle in the center of the roof. The hotel opens in the middle, having a lobby and restaurant on one half, and 2 hotel rooms on the other half. 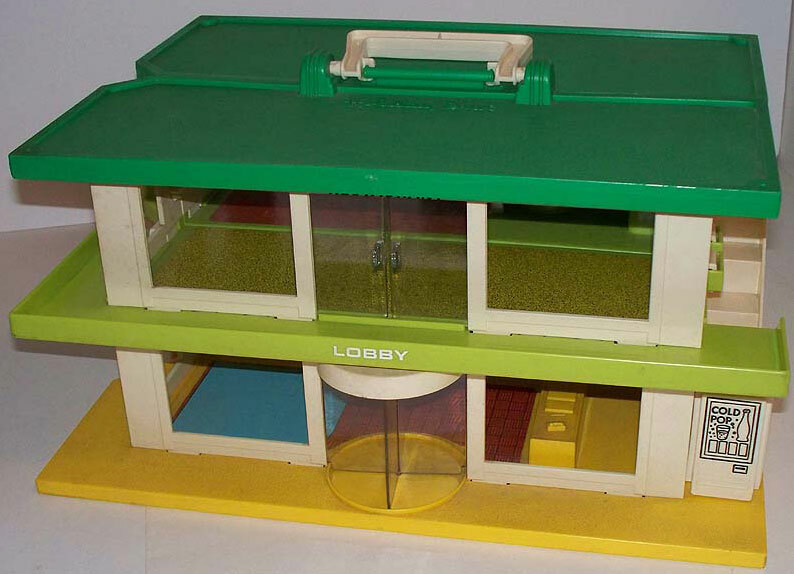 The lobby has a clear revolving front door, 2 large front windows, 1 small side window, and an attached yellow lobby counter (molded phone and papers on counter top). 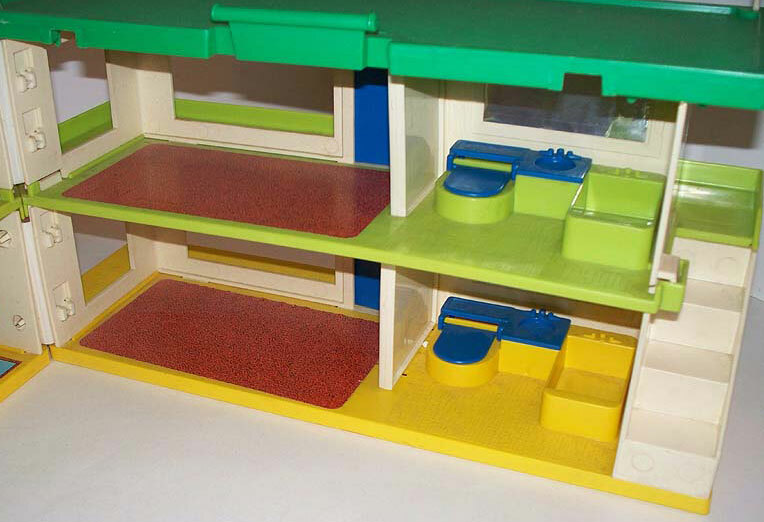 The outside end has a 3-step stairways and a molded-in snack machine marked "COLD POP". The restaurant has 2 clear entrance doors, 2 large front windows and 1 small side window. Both hotel rooms have a blue door (bottom room door marked "101", top room door marked "201"). Both rooms has 1 large front window, 1 small side window, and a molded-in bathroom. Each bathroom has a tub, sink and toilet. Sinktop and toilet are blue (blue toilet lid lifts). 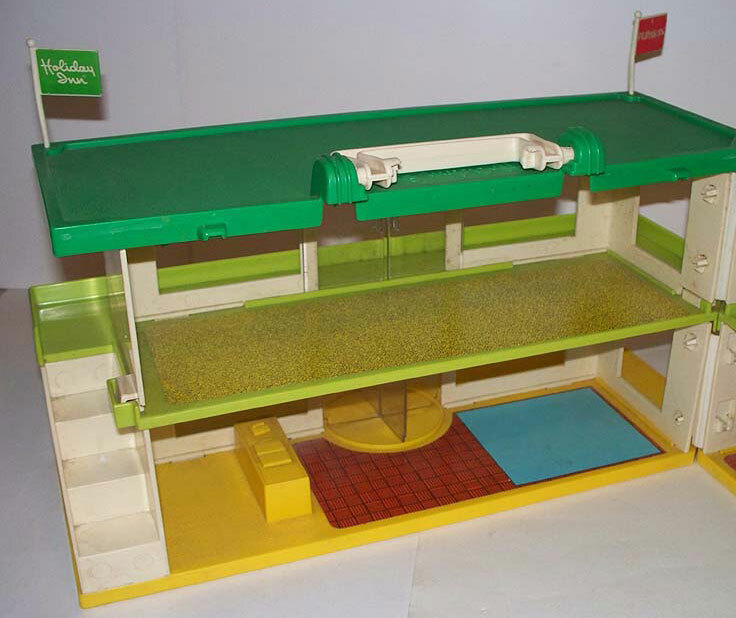 The outside end has a 3-step stairways, a molded-in ice machine marked "ICE", and a molded in doghouse marked "KENNEL". Lobby Floor - Rectangular logo with a brown square "rug" pattern on one side (half circle cut-out for revolving door in brown rug area) and a square blue "rug" on the other side. Restaurant Floor - Large rectangular green/yellow speckled restaurant floor. 2 each - Guest Room Floor - Rectangular brown speckled guest room floor. PSK38 - Blue flag with 2 white symbols: 1) a circle with 3 wavy lines inside, 2) a white bird (dove) symbol. 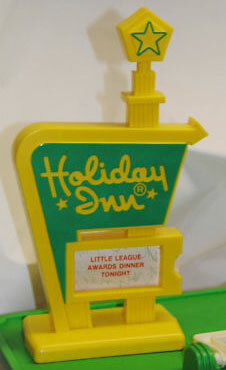 PSK39 - Green flag marked "Holiday Inn®" in white. PSK40 - Red flag marked "Playskool" in white. PSK41 - Red/white/blue American flag. PSK42 - Playboard - Red square playboard (thick, like a game board) that folds in half. 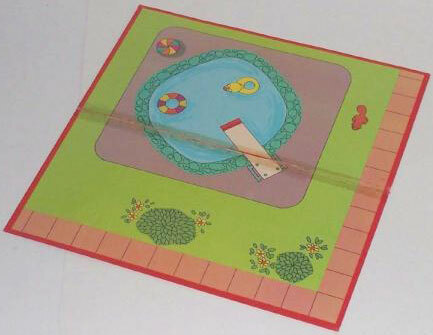 The playboard has pink sidewalk on 2 edges, includes a lawn with bushes, flowers, and a squirl, and includes a swimming pool. The pool has a concrete patio, has a diving board, and a floating ring and yellow duck float in the pool. PSK43 - Holiday Inn® "Great Sign" - Large yellow sign with "Holiday Inn®" within a green background. The top of the sign has a green star outline. The bottom part of the sign has a rectangular opening (to insert announcement cards). 2 each - Beds: Squared double bed with a large headboard, 2 square molded-in pillows, and 4 short rounded "legs" on the 4 bottom corners. Bottom of bed marked, "351881-#" (# equals any 1-9 digit). Measures 2-3/8" long x 2-3/8" wide (headboard) x 1-1/8" tall (headboard). See variations below for color options. 2 each - End Tables: Small square table with X-shaped legs on the bottom. Bottom of tabletop marked, "351912". Measures 1-5/16" x 1-5/16" tabletop x 3/4" tall. See variations below for color options. 4 each - Chairs: Small square chair with arm rests on 2 sides, a tall backrest, and a small square raised outline base. Bottom of chair marked, "351911". Measures 1-3/8" wide x 1-1/8" deep x 1-5/16" tall (backrest). See variations below for color options. 2 each - Restaurant Booths: Squared restaurant booth with 2 bench seats, each with a tall rectangular backrest, and a retangular table slightly raised between the benches. The table has a molded-in 4-plate setting. See variations below for color options. 1 each - Patio Table - Round table with X-shaped "legs". The table is made of very thin plastic, so the legs are often bent. Measures 2-3/4" diameter x 1" tall. See variations below for color options. 1 each - PSK62 - Buffet Table - Blue rectangular buffet table with 2 "legs" (support tab under each long end of table). The top includes a white rectangular litho of a dinner buffet: includes brown meat with long knife, 2 yellow and 3 green veggie, a salad bowl, and small salad topping containers. 1 each - PSK63 - Linen Cart - Blue rectangular linen cart with 2 large wheels on the rear bottom sides (wheels do not roll), and a holded in handle on the rear top edge. The top of the cart has a molded-in key, button, and towels. Swing - 1-seat swing on an a-frame base. The square seat has 2 upright swing arms that attach to the top swing pole. The base has 2 upside down V-shaped support arms (hold up pole attached to swing seat) with a rectangular connector between them at the bottom (under the swing seat). The swing and swing base are available in blue, red and yellow:swings can be a match or mixture of any of these colors. Measures 4" tall x 3-1/8" wide x 3-3/8" deep. See variations below for color options. Slide - 3-step slide with raised "armrails" on the sides of the steps and raised rounded "rails" on sides of the top step. Measures 6-1/2" long x 3-1/3" tall x 1-1/2" wide. See variations below for color options. 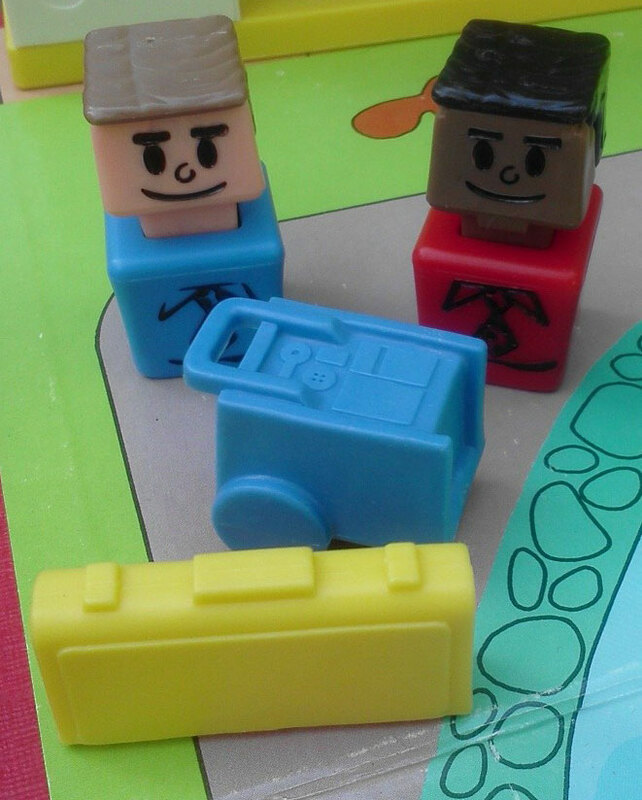 PSK34 - 1 each - Blue top, red base squared car. The red interior is square with a seat backrest divider in the center (can seat 4 figures). Rolls on 4 black wheels marked "Playskool". Wheels have red center rivets. Bottom of car is marked, "PLAYSKOOL, INC., CHICAGO, ILLINOIS, ITEM NO 480, 351902-#. (# = any number 1-9)". Measures 3-3/4" long x 3-1/8" wide x 1-3/4" tall. PSK35 - 1 each - Red top, blue base squared car. The blue interior is square with a seat backrest divider in the center (can seat 4 figures). Rolls on 4 black wheels marked "Playskool". Wheels have blue center rivets. Bottom of car is marked, "PLAYSKOOL, INC., CHICAGO, ILLINOIS, ITEM NO 480, 351902-#. (# = any number 1-9)". Measures 3-3/4" long x 3-1/8" wide x 1-3/4" tall. 2 Suitcases: Thin rectangular suitcase (resembles a briefcase) with raised molded "handle and latches" on the top edge. The 2 rectangular sides have a slightly raised rectangular panel. Suitcase is not hinged and does NOT open. See variations below for color options. PSK4 - Blue base, brown hair, chest design: Triangle Collar, Polka-dot Tie. 2 each - PSK7 - Green base, yellow hair, chest design: Curved collar, Pearl necklace. PSK10 - Red base, black hair, chest design: Triangle Collar, Polka-dot Tie. PSK12 - Red base, brown hair, chest design: Triangle Collar, Polka-dot Tie. PSK20 - Yellow base, yellow hair, chest design: Curved collar, Pearl necklace. PSK70 - Dog - Square (rectangular) white dog figure with molded long hair. The dog is the same size as the people figures, but has 4 short squared legs on one side. Featured in December 1974 Good Housekeeping Magazine Ad. Featured in 1974 JcPenny Christmas Wish Book (page 321) - price $13.97. Featured in 1975 Sears Christmas Wishbook (page 488) - price $14.87.